MRL/MpJ-Faslpr (MRL-Faslpr) mice develop a spontaneous T cell and macrophage-dependent autoimmune disease that shares features with human lupus. Interactions via the programmed death 1/programmed death ligand 1 (PD-1/PD-L1) pathway down-regulate immune responses and provide a negative regulatory checkpoint in mediating tolerance and autoimmune disease. Therefore, we tested the hypothesis that the PD-1/PD-L1 pathway suppresses lupus nephritis and the systemic illness in MRL-Faslpr mice. For this purpose, we compared kidney and systemic illness (lymph nodes, spleen, skin, lung, glands) in PD-L1 null (−/−) and PD-L1 intact (wild type, WT) MRL-Faslpr mice. Unexpectedly, PD-L1−/−;MRL-Faslpr mice died as a result of autoimmune myocarditis and pneumonitis before developing renal disease or the systemic illness. Dense infiltrates, consisting of macrophage and T cells (CD8+ > CD4+), were prominent throughout the heart (atria and ventricles) and localized specifically around vessels in the lung. In addition, once disease was evident, we detected heart specific autoantibodies in PD-L1−/−;MRL-Faslpr mice. This unique phenotype is dependent on MRL-specific background genes as PD-L1−/−;MRL+/+ mice lacking the Faslpr mutation developed autoimmune myocarditis and pneumonitis. Notably, the transfer of PD-L1−/−;MRL+/+ bone marrow cells induced myocarditis and pneumonitis in WT;MRL+/+ mice, despite a dramatic up-regulation of PD-L1 expression on endothelial cells in the heart and lung of WT;MRL+/+ mice. Taken together, we suggest that PD-L1 expression is central to autoimmune heart and lung disease in lupus-susceptible (MRL) mice. Lupus is a human autoimmune disease characterized by chronic inflammation of multiple tissues including kidney, skin, heart, joints, lung, salivary/lacrimal glands, and brain. Lesions in MRL-Faslpr mice share many features with those of human lupus (1, 2, 3). They develop disease in the same tissues as humans with lupus, with the notable exception of the heart, and succumb to a fatal kidney disease (50% mortality at 5 mo of age) (4). T cells accumulate in the peripheral lymphoid tissues of MRL-Faslpr mice leading to lymphadenopathy and splenomegaly as a result of a spontaneous mutation in Fas (5, 6). These T cells, along with macrophage (Mø)3 infiltrates, inflame tissues and are required for disease (7, 8, 9, 10). Although there are high levels of circulating autoantibodies (autoAbs), their role in this disease is unclear (11). Congenic Fas-intact MRL mice (MRL+/+) develop a latent, less-fulminant lupus (1, 12) indicating that background genes are central to lupus in MRL mice (13, 14). Since disease is spontaneous and highly predictable in MRL mice, this model is a powerful tool for dissecting the pathogenesis of lupus. The B7/CD28 costimulatory pathway regulates immune cell activation. We previously reported that B7.1 and B7.2 expression promotes lupus since B7.1/B7.2 null MRL-Faslpr mice are protected from renal disease and the systemic illness (15). Recent attention has focused on an additional member of this family of costimulatory molecules, programmed death 1 (PD-1) and its ligands PD ligand 1 (PD-L1) and PD ligand 2. PD-1, is broadly expressed on multiple hematopoetic cells including: T cells, B cells, monocytes, and Mø upon activation (16, 17, 18). Similarly, PD-L1 is expressed by a variety of cell types, including APCs and a broad range of parenchymal cells (19). For the most part, engagement of PD-1 inhibits T and B cell functions (20). PD-1 and PD-L1 are integral in suppressing autoimmune kidney disease. In particular, PD-1 null mice on the C57BL/6 (B6) background (PD-1−/−;B6) develop mild, focal glomerulonephritis, which increases in incidence and severity in mice with the Faslpr mutation (PD-1−/−;B6-Faslpr) (21). However, the pathology in the renal interstitium, tubules, and vasculature, as well as the mechanisms responsible for inciting glomerular disease, was not explored. Furthermore, kidney pathology and function was exacerbated in PD-L1−/−;B6 mice during induced autoimmune kidney disease, nephrotoxic serum nephritis (17). Thus, the PD-1/PD-L1 pathway dampens autoimmune responses in the kidney. Our goal was to test the hypothesis that elimination of PD-1/PD-L1 signaling exacerbates MRL-Faslpr lupus nephritis and the systemic illness. For this purpose, we generated PD-L1−/−;MRL-Faslpr and PD-L1−/−;MRL+/+ mice. Unexpectedly, PD-L1−/−;MRL-Faslpr and PD-L1−/−;MRL+/+ mice succumbed to autoimmune myocarditis and pneumonitis before the development of lupus nephritis and systemic features characteristic of MRL mice. 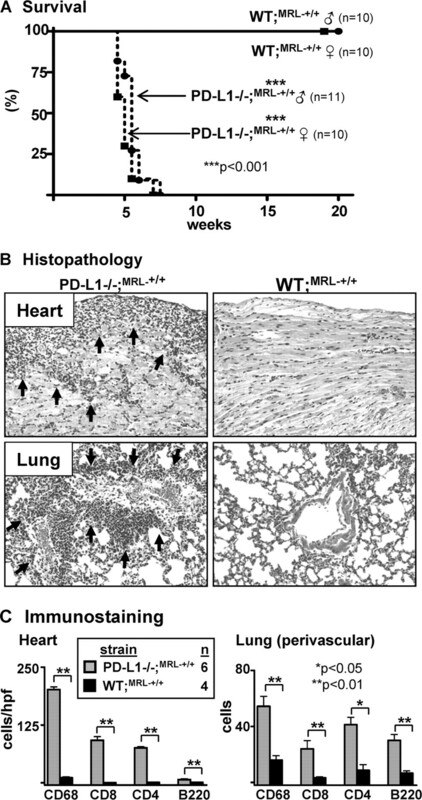 This suggests the PD-1/PD-L1 pathway is providing an essential negative regulatory checkpoint to prevent autoimmune heart and lung disease in MRL mice. PD-L1−/− mice on the B6 background (PD-L1−/−;B6) were generated previously (22). MRL/MpJ (MRL+/+) and MRL/MpJ-Faslpr/J (MRL-Faslpr) mice were purchased from The Jackson Laboratory. PD-L1−/−;B6 mice were backcrossed to MRL-Faslpr mice for six generations (N6). Because the genes for PD-L1 and Fas are both on chromosome 19, we screened large numbers of mice for recombinants. Genotyping for PD-L1 (22) and Fas (23) were performed as previously described. MRL-Faslpr and MRL+/+ mice will be referred to collectively as MRL mice. PD-L1−/−;B6 mice were backcrossed to MRL+/+ mice for ten generations (N10). Mice were housed and bred in a pathogen-free animal facility. Use of mice in our study was reviewed and approved by the Standing Committee on Animals in the Harvard Medical School in adherence to the National Institutes of Health Guide for the care and use of laboratory animals. Heart, lung, liver, and kidney tissues were fixed overnight in 10% neutral buffered formalin, stored in 70% ethanol, and embedded in paraffin. Sections (4 μm) were stained with H&E. Myocarditis was graded as previously described (24) by microscopic examination of H&E-stained midventricular cross sections using a 0–4 scale as follows: Grade 0) no inflammation; Grade 1) one to five distinct inflammatory foci with total involvement of 5% or less of the cross-sectional area; Grade 2) more than five distinct inflammatory foci, or involvement of >5% but <20% of the cross-sectional area; Grade 3) diffuse inflammation involving over 20–50% of the area; and Grade 4) diffuse inflammation involving >50% of the area. Inflammatory lung lesions were graded by microscopic examination of a near-complete H&E-stained cross-section of inflated lung using a 0–4 scale as follows: Grade 0) no inflammation; Grade 1) one to two distinct perivascular and/or peribronchial inflammatory foci in the cross-sectional area; Grade 2) three to four lesions; Grade 3) four to eight lesions; and Grade 4) > nine lesions. We assessed kidney pathology on periodic acid-Schiff’s reagent stained sections of PD-L1−/−;MRL-Faslpr and wild type (WT);MRL-Faslpr mice at 2 mo of age as previously described (17). We assessed the levels of blood urea nitrogen in serum of PD-L1−/−;MRL-Faslpr and WT;MRL-Faslpr mice at 2 mo of age as previously described (17). Heart and lung tissue was processed and stained for the presence of CD68, CD4, CD8, PD-1, and PD-L1 as previously described for the kidney (17). We prepared single-cell suspensions from lung tissue by mashing the entire lung between 40-μm nylon cloth mesh (Thermo Fisher Scientific) with a plastic syringe barrel in RPMI-10. Single-cell suspensions from the heart were prepared by cutting the heart into pieces (<1 mm) with a razor blade followed by incubation with collagenase type IV (1 mg/ml, Worthington Biochemical) in HBSS (Invitrogen Life Technologies) supplemented with 5 mM CaCl2 at 37°C for 45 min. Following digestion, tissue was dissociated by pipetting and the resulting cell solution was filtered through 40 μm mesh to remove undigested tissue. RBC were lysed by incubation in ACK lysis buffer for 5 min at room temperature. Cells were washed twice with 10 ml RPMI-10 and refiltered. We stained these cells with fluorescently labeled Abs as previously described (10). We collected heart (5–10 × 104) and lung (1–2 × 105) cells using a FACSCalibur (BD Biosciences) and analyzed the data using FlowJo software (Tree Star). We used the following Abs from eBioscience for FACS analysis: FITC-conjugated anti-CD45.1 (A20); PE-conjugated anti-PD-1 (J43), PE-Cy5 conjugated anti-CD8 (53-6.7), and anti-CD11c (N418); and allophycocyanin-conjugated anti-CD4 (L3T4) and anti-CD45.1 (A20). We also used FITC-conjugated CD11b (M1/70) from BD Pharmingen and FITC-conjugated anti-CD68 (FA11) from Serotec. To detect anticardiac myosin or anticardiac troponin I autoAbs, we coated 96-well plates with porcine cardiac myosin (5 μg/ml, Sigma-Aldrich) or mouse cardiac troponin I (1 μg/ml, Life Diagnostics) in bicarbonate buffer overnight. After blocking with 1% BSA in PBS, we added diluted serum samples (1/50, 1/200, 1/800, 1/3200, and 1/6400). Bound autoAbs were detected with HRP conjugated anti-mouse IgG, IgG1, IgG2a, and IgG2b Abs (1/1000, Southern Biotechnology Associates), developed with TMB, and stopped with H2SO4. Serum from age-matched B6 mice was used as a negative control. Optical densities were measured at 450 nm. Ab endpoint titers for each mouse were determined as the greatest positive dilution of serum. We analyzed the anti-dsDNA autoAb (total IgG) in the sera of PD-L1−/−; MRL-Faslpr and WT;MRL-Faslpr mice diluted 1/50 as previously reported (25). To determine the optimal concentration of anti-mouse C3 for staining, we tested a large range of serial dilutions (1/2000; 1/4000; 1/8000; 1/32,000; 1/64000; 1/128,000; 1/256,000; and 1/512,000). Based on the results, we stained heart and lung sections from PD-L1−/−;MRL-Faslpr and WT;MRL-Faslpr mice (1 and 2 mo) with fluorescein-conjugated anti-mouse C3 (1/8000; Capell/ICN) for 30 min at room temperature. Sections were mounted in Vectoshield plus DAPI (Vector) and analyzed immediately with a fluorescent microscope. The sections were scored based on the area of the cross-section with positive staining: Score 0) no specific staining; Score 0.5) 1–5%; Score 1) 5–10%; Score 2) 11–15%; Score 2.5) 16–20%; and Score 3) 20–30%. We isolated BM from PD-L1−/−;MRL+/+ or WT;MRL+/+ (PD-L1+/+;MRL+/+ and PD-L1+/−;MRL+/+) mice as previously described (26). PD-L1+/−;MRL+/+ hosts (1 mo) were lethally irradiated (1000 rads) and reconstituted with PD-L1−/−;MRL+/+ or WT;MRL+/+ BM cells (5–7 × 106). We monitored BM chimeric mice for signs of illness (labored breathing, lethargy, etc.) and sacrificed mice at the onset of symptoms. Control mice were sacrificed on the same day as the last PD-L1−/−;MRL+/+ BM chimera. We evaluated the transfer of heart and lung disease by histopathology and immunostaining of heart and lung sections. The data represent the mean ± SEM and were prepared using Graph-Pad Prism Version 4.0 (Graph Pad). We used the nonparametric Mann-Whitney U Test to evaluate p values. To evaluate the role of the PD-1 pathway in the systemic autoimmune disease in MRL-Faslpr mice, we generated PD-L1−/−;MRL-Faslpr mice. We tested the hypothesis that autoimmune disease in MRL-Faslpr would be exacerbated in PD-L1−/−;MRL-Faslpr mice. In fact, PD-L1−/−;MRL-Faslpr mice died much earlier than their PD-L1+/−;MRL-Faslpr and PD-L1+/+;MRL-Faslpr (WT;MRL-Faslpr) littermates (Fig. 1⇓A). The increased mortality occurred in both male and female PD-L1−/−;MRL-Faslpr mice with median survival times of 9 and 11 wk, respectively. This is noteworthy since disease is typically delayed in male MRL-Faslpr mice. In contrast, none of the WT;MRL-Faslpr mice died before 20 wk of age. Thus, survival is dramatically decreased in PD-L1−/−;MRL-Faslpr mice. 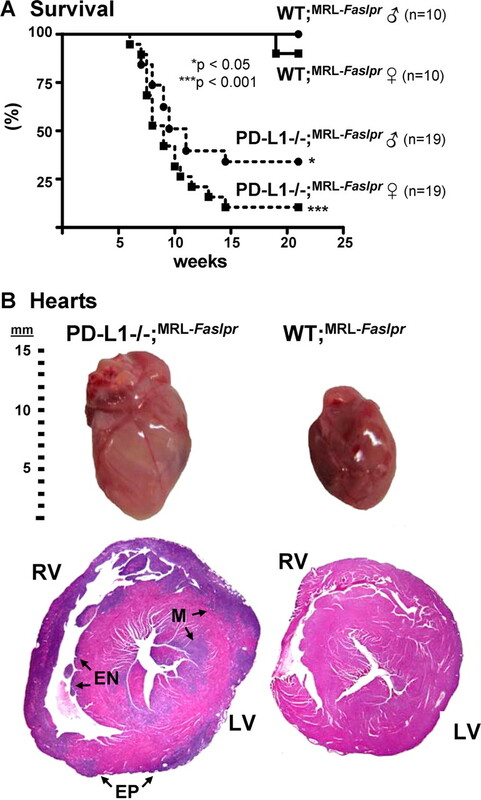 PD-L1−/−;MRL-Faslpr mice die more rapidly than WT;MRL-Faslpr mice with enlarged hearts. A, Kaplan-Meier survival curves of PD-L1−/−;MRL-Faslpr and WT;MRL-Faslpr littermates. B, Photograph of whole hearts (top) and lateral H&E-stained heart sections (×2) from moribund PD-L1−/−;MRL-Faslpr (left) and WT;MRL-Faslpr mice (right) (2 mo). Involvement of the right and left ventricles, (RV and LV, respectively) as well as the epicardium (EP), endocardium (EN), and myocardium (M) is indicated. Note the transmural involvement of nearly the entire right ventricle. The phenotypic expression of disease drastically changed in PD-L1−/−;MRL-Faslpr compared with the WT;MRL-Faslpr mice. Autoimmune disease in WT;MRL-Faslpr mice is characterized by massive lympadenopathy, splenomegaly, skin lesions, and fatal renal disease at 5–6 mo of age. In contrast, PD-L1−/−;MRL-Faslpr mice died between 2 and 3 mo of age from congestive heart failure with extensive edema, ascites, pleural effusions, massively enlarged hearts with areas of discoloration (Fig. 1⇑B), inflamed lungs, and large congested livers. Of note, with the exception of an increase in spleen weight, the PD-L1−/−;MRL-Faslpr mice did not share any of the gross characteristic features of moribund MRL-Faslpr mice (data not shown). Since MRL-Faslpr mice do not develop myocarditis, these data indicate that PD-L1−/−;MRL-Faslpr mice succumb to a disease that differs from the WT strain resulting in early death. To more fully explore this novel phenotype, we compared the histopathology of hearts, lungs, livers, and kidneys from moribund PD-L1−/−;MRL-Faslpr and WT;MRL-Faslpr mice. In hearts from PD-L1−/−;MRL-Faslpr mice, lesions were characterized by a pancarditis involving the walls of all chambers; they spanned the endocardium, myocardium, and epicardium and the atria and ventricles, bilaterally. The right ventricle was often involved transmurally at a single site and some areas had focal wall thinning. Lesions consisted typically of dense mononuclear infiltrates with associated myocyte injury (Fig. 2⇓A, arrowhead) in a patchy to diffuse distribution. In contrast, the hearts of WT;MRL-Faslpr mice were histologically normal with no evidence of infiltrates (Figs. 1⇑B and 2⇓A). PD-L1−/−;MRL-Faslpr lung-lesions typically consisted of focal collections of mononuclear inflammatory cells in a predominantly perivascular (Fig. 2⇓B, arrows) but occasionally peribronchial location. Lung lesions were occasionally seen in WT;MRL-Faslpr mice in the absence of myocardial pathology. Conversely, myocardial lesions without lung pathology was rarely noted in PD-L1−/−;MRL-Faslpr mice. In addition, small perivascular inflammatory lesions were evident in the livers of nearly all PD-L1−/−;MRL-Faslpr mice at the time of death (data not shown). Interestingly, we did not detect an increase in leukocytic infiltrates in the kidneys of PD-L1−/−;MRL-Faslpr mice as compared with age-matched WT;MRL-Faslpr mice (Fig. 2⇓C). And, although we detected a modest increase in glomerular pathology, we did not detect a loss of renal function (blood urea nitrogen) in moribund PD-L1−/−;MRL-Faslpr mice as compared with age-matched WT;MRL-Faslpr mice (data not shown). 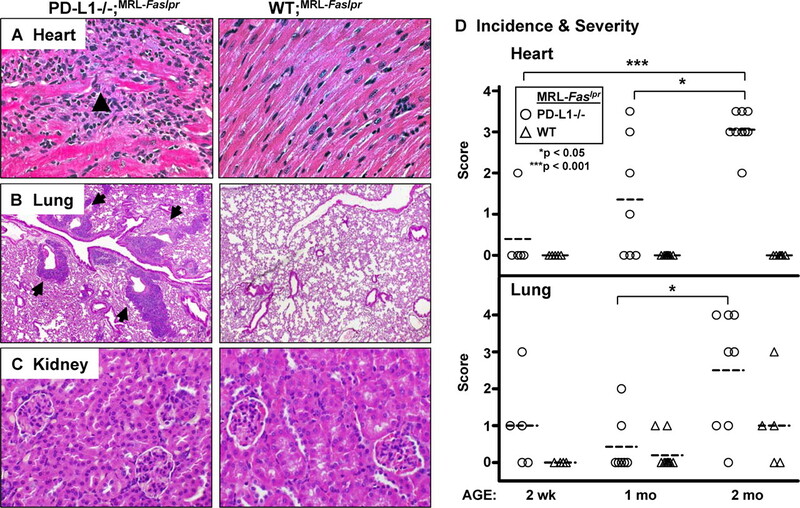 Thus, the early demise in PD-L1−/−;MRL-Faslpr mice did not result from an acceleration in renal disease, but rather from fulminant heart and lung pathology. PD-L1−/−;MRL-Faslpr mice spontaneously develop severe myocarditis and pneumonitis, but not renal disease. Photomicrographs of heart ventricle (×40) (A), lung (×10) (B), and kidney sections (×40) (C) from PD-L1−/−;MRL-Faslpr and WT;MRL-Faslpr mice (2 mo). A, Arrowheads indicate areas of myocyte damage. B, Arrows (left panel) indicate pulmonary vessels surrounded by mononuclear cells. H&E-stained sections. D, Temporal analysis of myocarditis (top) and pneumonitis (bottom) in PD-L1−/−;MRL-Faslpr and WT;MRL-Faslpr mice at 2 wk, 1, and 2 mo of age (n = 4–10 mice/group) using separate scoring systems (0–4). Means are indicated by dashed line. To determine the temporal development of myocarditis and pneumonitis in PD-L1−/−;MRL-Faslpr mice, we analyzed heart and lung pathology at multiple time points (2 wk, 1, and 2 mo) (Fig. 2⇑D). There were signs of disease in the heart and lungs of some PD-L1−/−;MRL-Faslpr mice by 2 wk of age and the incidence and severity progressively rose between 1 and 2 mo of age. By comparison, heart disease was not detectable and lung disease was less severe in WT;MRL-Faslpr mice. Due to the rapidity of disease, it was not possible to determine by morphologic criteria whether disease arose first in the heart or lung of PD-L1−/−;MRL-Faslpr mice. Thus, we conclude myocarditis and pneumonitis arise concurrently in PDL1−/−;MRL-Faslpr mice. To identify the intracardiac and intrapulmonary leukocytes in PD-L1−/−;MRL-Faslpr mice, we examined the accumulation of Mø, T (CD4+ and CD8+), and B220+ cells over a 2 mo period (Fig. 3⇓). We detected more Mø than CD8+ T cells and very few CD4+ T cells in the heart in PD-L1−/−;MRL-Faslpr mice at 2 wk of age. The relative numbers of each of these leukocyte populations progressively increased from 2 wk through 2 mo of age specifically in PD-L1−/−;MRL-Faslpr, while the small number of resident leukocytes in the heart of WT;MRL-Faslpr mice did not change (Fig. 3⇓A). Of note, while dendritic cells express CD68, we determined that the CD68+ cells in the heart are primarily Mø by flow cytometry, as these cells express high levels of CD11b and are autofluorescent (27) (data not shown). Since lymphadenopathy and splenomegaly typical of WT;MRL-Faslpr mice is predominately comprised of a unique population of CD4−CD8− T cells that express the B cell determinant, B220 (double negative (DN) T cells), we also probed for B220+ cells. We did not detect an increase in B220+ cells in the hearts of PD-L1−/−;MRL-Faslpr as compared with WT;MRL-Faslpr mice at any time point, indicating that neither DN T cells or B cells are in the hearts of PD-L1−/−;MRL-Faslpr mice during myocarditis. The lack of DN T cell infiltrates in the heart is likely due to the age of the mice at the time of death. The B220+ DN T cells that are characteristic of MRL-Faslpr mice do not become abundant until 2–3 mo of age. Taken together, these results suggest destruction of myocytes in PD-L1−/−;MRL-Faslpr mice is mediated largely by Mø, CD8+, and/or CD4+ T cells. Mø and T cell infiltrates are increased in the heart and lung of PD-L1−/−;MRL-Faslpr mice. The presence of Mø, T cells (CD4+ and CD8+), and B220+ cells in the heart and lung of PD-L1−/−;MRL-Faslpr and WT;MRL-Faslpr mice was evaluated at 2 wk, 1, and 2 mo of age by immunohistochemistry. Representative photomicrographs (×20) of heart (A) and lung (B) sections from PD-L1−/−;MRL-Faslpr and WT;MRL-Faslpr mice (2 mo). Lung sections were stained with CD79 to distinguish B cells and DN T cells (bottom left panel). Heart infiltrates were quantitated by counting 10 high power fields (hpf)/section and perivascular lung infiltrates were quantitated by counting 10 vessels/section. Data are mean ± SEM. The lungs, in contrast to the heart, had substantial numbers of resident leukocytes, the majority of which were CD68+ alveolar Mø and DC, with fewer T and B cells. We detected an increase in interstitial (data not shown) and perivascular (Fig. 3⇑B) leukocytes in PD-L1−/−;MRL-Faslpr as compared with WT;MRL-Faslpr mice at 2 wk of age. Perivascular infiltrates consisting of Mø, T cells, and B220+ cells, which were evident at 2 wk of age, progressively increased until 2 mo of age, but were notably absent in WT;MRL-Faslpr mice (Fig. 3⇑B). To distinguish whether the B220+ cells in the lungs of PD-L1−/−;MRL-Faslpr mice were DN T cells or B cells, we stained lung sections for the presence of B cell specific proteins, CD79 (Fig. 3⇑B, bottom left panel) and CD19 (data not shown). We determined that the majority of these B220+ cells were B cells. As B cells can be inhibitory during autoimmune responses (28), it is intriguing to hypothesize that these B cells may be playing a regulatory role during pneumonitis in PD-L1−/−; MRL-Faslpr mice. Regardless, PD-L1 limits the accumulation of B cells, along with Mø and T cells (CD4+ and CD8+) in the lungs of MRL-Faslpr mice. To define the leukocytes in the heart and lung in the PD-L1−/−;MRL-Faslpr mice with myocarditis and pneumonitis that express PD-1, we evaluated PD-1 expression on infiltrating leukocytes. The vast majority of infiltrating cells in the heart of PD-L1−/−;MRL-Faslpr mice with myocarditis expressed PD-1 (Fig. 4⇓A, top right panel). In contrast, PD-1 is barely detected in the WT;MRL-Faslpr mice with normal hearts (Fig. 4⇓A, top left panel). Similarly, PD-1 expression was drastically up-regulated in the lung of PD-L1−/−;MRL-Faslpr mice with pneumonitis and localized primarily to the perivascular leukocytes (Fig. 4⇓A, bottom right panel). As in the heart, PD-1 expression was sparse in the lung of WT;MRL-Faslpr mice where it localized to the few perivascular leukocytes (Fig. 4⇓, bottom left inset). Using flow cytometry, we determined that PD-1 was expressed on Mø and T (CD4+ and CD8+) cells (Fig. 4⇓B), but not B220+ cells (data not shown) in the heart and lung of PD-L1−/−;MRL-Faslpr mice with myocarditis and pneumonitis. Interestingly, we did not detect an increase in PD-1+ cells in the spleen, kidney, or liver of PD-L1−/−;MRL-Faslpr mice (data not shown). Thus, PD-1+ Mø and T cells accumulate specifically in the heart and lung of PD-L1−/−;MRL-Faslpr mice during myocarditis and pneumonitis. PD-1 expression is increased in the heart and lung of PD-L1−/−;MRL-Faslpr mice. PD-1 expression was evaluated in the heart and lung of WT;MRL-Faslpr and PD-L1−/−;MRL-Faslpr mice (2 mo) by immunohistochemistry (frozen sections) and flow cytometry. A, Representative photomicrographs (×10, with ×40 inset) of heart (top) and lung (bottom). B, Flow cytometric analysis of PD-1 expression in the heart and lung of PD-L1−/−;MRL-Faslpr mice (2 mo). Heart (top) and lung (bottom) single-cell suspensions were gated on CD68+, CD8+, or CD4+ cells. Representative flow cytometry plots with the percentage of PD-1+ CD45.1+ cells within these populations are shown. Heart-specific autoAbs are common during myocarditis and may contribute to disease (29). As the most abundant Ag in the heart is cardiac myosin (30), we tested whether PD-L1−/−;MRL-Faslpr mice generated anticardiac myosin autoAbs. We detected high titers of anti-cardiac myosin autoAbs (total IgG) in PD-L1−/−;MRL-Faslpr mice (1/5300 ± 700, n = 10) in comparison to minimal levels in WT;MRL-Faslpr mice (1/560 ± 150, n = 6) at 2 mo of age (p < 0.01). In particular, we detected an increase in the titers of IgG1 and IgG2a, and to a lesser extent IgG2b, isotypes of anticardiac myosin autoAbs (data not shown). Anticardiac troponin I autoAbs have been detected in PD-1−/−;BALB/c mice and contribute to the development of dilated cardiomyopathy (31). Therefore, we also probed for the presence of anticardiac troponin I autoAbs. Likewise, we detected increased titers of anticardiac troponin I autoAbs (total IgG) in PD-L1−/−;MRL-Faslpr mice (1/733 ± 67, n = 9) in comparison to WT;MRL-Faslpr mice (1:286 ± 87, n = 7) at 2 mo of age (p < 0.05). Interestingly, we did not detect anticardiac myosin autoAbs (2 wk and 1 mo) or anticardiac troponin I autoAbs (1 mo) before overt disease. Therefore, we explored the possibility that cardiac autoAbs deposit in the heart, which prevents detection in the serum before overt disease. For this purpose, we measured C3 deposits in the heart of PD-L1−/−;MRL-Faslpr and WT;MRL-Faslpr mice at 1 and 2 mo of age. Although we detected an increase of C3 deposits in PD-L1−/−; MRL-Faslpr as compared with WT;MRL-Faslpr hearts at 2 mo of age, we did not detect a difference at 1 mo of age (data not shown). This is consistent with the concept that cardiac-specific autoAbs rise once the heart muscle is damaged. Of note, titers of anti-dsDNA autoAbs were not increased in PD-L1−/−;MRL-Faslpr mice as compared with WT;MRL-Faslpr mice at 2 mo of age. (data not shown). This indicates that the increase in cardiac-autoAbs is specific to the unique autoimmune disease in PD-L1−/−;MRL-Faslpr mice, as opposed to a broad increase in autoAb production. Despite the specificity of these autoAbs, their late emergence contrasts with the early emergence of these autoAbs in PD-1−/−;BALB/c mice (31, 32) and suggests that cardiac autoAbs do not initiate disease in PD-L1−/−;MRL-Faslpr mice. The Faslpr mutation converts a mild, latent autoimmune disease in MRL+/+ mice into a fulminant and severe disease in MRL-Faslpr mice (2, 4). To determine whether the Faslpr mutation is required for the autoimmune myocarditis and pneumonitis in PD-L1−/−;MRL-Faslpr mice, we generated PD-L1−/−;MRL+/+ mice. 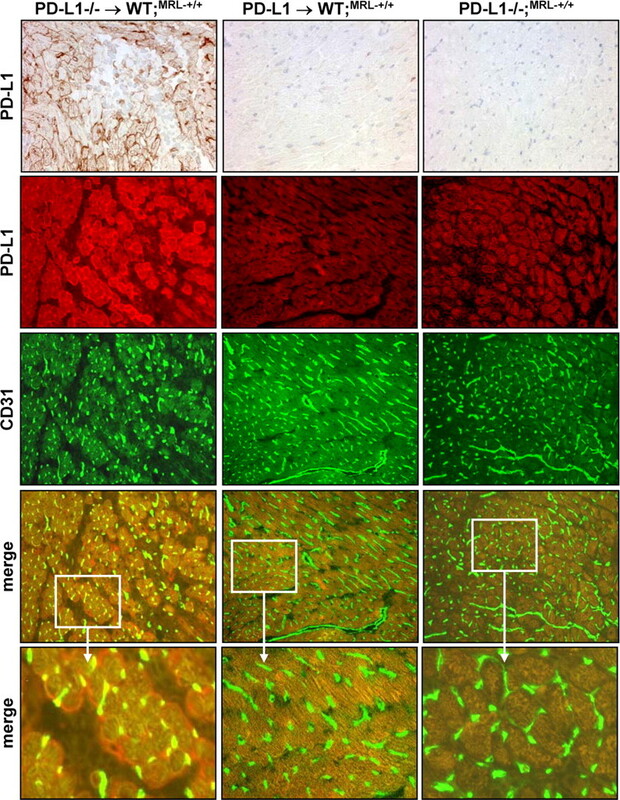 Similar to PD-L1−/−;MRL-Faslpr mice, PD-L1−/−;MRL+/+ mice die at a young age. Remarkably, the median survival time of PD-L1−/−;MRL+/+ mice (male and female) was 5 wk (Fig. 5⇓A). In contrast, the average lifespan of WT;MRL+/+ mice ranges between 1 and 2 years of life (Jackson ImmunoResearch Laboratories strain 000486). In addition, PD-L1−/−;MRL+/+ mice develop myocarditis and pneumonitis (Fig. 5⇓, B and C) similar to PD-L1−/−;MRL-Faslpr mice (Fig. 2⇑). The pattern of anticardiac myosin and anticardiac troponin I autoAbs in PD-L1−/−;MRL+/+ mice was similar in quantity and isotype expression to PD-L1−/−;MRL-Faslpr mice (data not shown). Thus, autoimmune myocarditis and pneumonitis is dependent on the MRL background and not on the Faslpr mutation in PD-L1−/−;MRL-Faslpr mice. Myocarditis and pneumonitis in PD-L1−/−;MRL-Faslpr mice is not dependent on the Faslpr mutation. A, Kaplan-Meier survival curves of PD-L1−/−;MRL+/+ males and females. B, Heart and lung sections (×20) from moribund PD-L1−/−;MRL+/+ and age-matched WT;MRL+/+ mice. Arrows indicate areas of mononuclear cell infiltration. C, Heart and lung infiltrates were assessed in moribund PD-L1−/−;MRL+/+ and age-matched WT;MRL+/+ mice as in Fig. 4⇑. PD-L1 is widely expressed on hematopoetic and parenchymal cells in many tissues (19). To determine whether PD-L1−/−;MRL+/+ hematopoetic cells are sufficient to confer disease, we transferred PD-L1−/−;MRL+/+ or WT;MRL+/+ BM into lethally irradiated WT;MRL+/+ mice (Fig. 6⇓). The WT;MRL+/+ recipients of PD-L1−/−;MRL+/+ BM developed signs of disease (lethargy, labored breathing, swollen belly) following reconstitution (4–6 wk). We detected myocarditis and pneumonitis rich in CD68+, CD8+, and CD4+ leukocytes (Fig. 6⇓, left panels) in WT;MRL+/+ recipients of PD-L1−/−;MRL+/+ BM, but not of WT;MRL+/+ BM (Fig. 6⇓, right panels). We also transferred PD-L1−/−;MRL+/+ BM into irradiated PD-L1−/−;MRL+/+ mice (4 wk) and found that these mice developed myocarditis and pneumonitis by 2 wk post transfer (data not shown). Since the lifespan of these mice was similar to unmanipulated PD-L1−/−;MRL+/+ mice (5–6 wks), we cannot distinguish between the disease that may have been present at the initiation of the experiment and disease induced by the transfer of PD-L1−/−;MRL+/+ BM. However, it is clear that PD-L1−/−; MRL+/+ hematopoietic BM cells are sufficient to induce myocarditis and pneumonitis in WT;MRL+/+ mice. 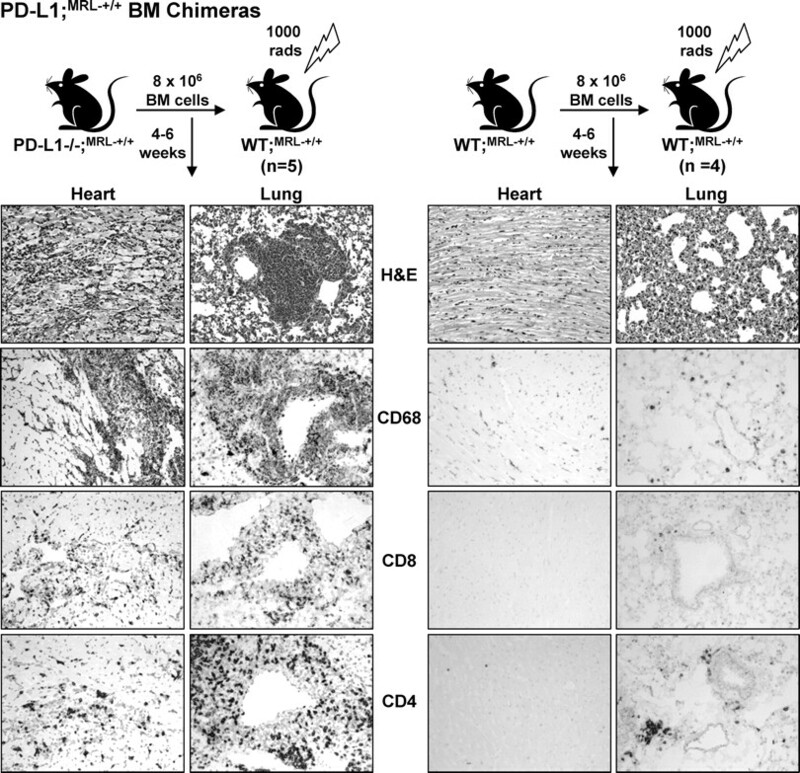 Myocarditis and pneumonitis develop when PD-L1−/−;MRL+/+ BM is transferred into WT;MRL+/+ mice. BM cells (8 × 106) from PD-L1−/−;MRL+/+ and WT;MRL+/+ mice were injected (i.v.) into lethally irradiated (1000 rad) WT;MRL+/+ mice. Myocarditis and pneumonitis was evaluated by histopathology (H&E) and immunostaining for the presence of CD68+, CD8+, and CD4+ cells. Representative photomicrographs are of heart and lung sections (×20). Although PD-L1−/− hematopoetic cells are sufficient to induce myocarditis and pneumonitis in WT;MRL+/+ BM chimeras, disease is less severe than in PD-L1−/−;MRL+/+ mice, as determined by histopathological criteria (data not shown). The delayed tempo of disease in these chimeras suggests that PD-L1 expression on parenchymal cells in WT;MRL+/+ BM chimeras may limit disease. To investigate this possibility, we evaluated PD-L1 expression in the heart and lung of WT;MRL+/+ BM chimeras (Fig. 7⇓). PD-L1 expression was robust in the heart and lung of PD-L1−/−;MRL+/+ BM recipients (Fig. 7⇓, top left panel), but not in WT;MRL+/+ BM recipients (Fig. 7⇓, top middle panel). The majority of endothelial cells, identified by CD31 (green), in the heart of PD-L1−/−;MRL+/+ BM recipients expressed PD-L1 (red) as shown in the merged images (yellow) (Fig. 7⇓A, bottom left panels). However, some PD-L1+ cells are not CD31+ (red only), and most likely correspond to myocytes that are surrounded by infiltrating PD-L1−/− leukocytes (pale staining areas). Similarly, we detected a dramatic up-regulation of PD-L1 throughout the lung on endothelial cells in PD-L1−/−;MRL+/+ BM recipients (data not shown). This striking induction of PD-L1 expression on the endothelium in the heart and lung with inflammation suggests that PD-L1 expression on parenchymal cells may play a role in limiting tissue damage once tolerance is broken. PD-L1 expression is up-regulated on endothelial cells in the heart and lung when inflammation is induced in WT;MRL+/+ mice. PD-L1 expression was analyzed on frozen heart sections from irradiated WT;MRL+/+ mice reconstituted with PD-L1−/−;MRL+/+ BM (left panels) or WT;MRL+/+ BM (middle panels), or PD-L1−/−;MRL mice (right panels) by immunohistochemistry (top row) and immunofluorescence (second row, red). Endothelial cells are detected by CD31 expression (third row, green). Costaining for CD31 and PD-L1 are in merged images (fourth and fifth rows, yellow). Representative photomicrographs (×20), except bottom row, which is an enlarged area (×3) of ×20 image marked by white box. Our studies reveal a critical role for PD-L1 in controlling autoimmune heart and lung disease. PD-L1−/−;MRL-Faslpr mice spontaneously develop a fulminant, fatal autoimmune myocarditis that resembles human autoimmune myocarditis (33). This is a dramatic finding since MRL-Faslpr mice do not have overt heart disease and typically succumb to a kidney illness. Perhaps, even more remarkable is the emergence of an aggressive autoimmune disease in PD-L1−/−;MRL+/+ mice (Fas-intact), since WT;MRL+/+ mice typically develop a more latent disease than WT;MRL-Faslpr mice. As PD-L1−/− mice on other backgrounds (B6 and BALB/c) are healthy (26) and PD-1−/−;B6 mice require the Faslpr mutation for consistent glomerulonephritis (21), this finding indicates that MRL background genes are central to autoimmune disease. In addition, our results highlight a dominant role for PD-L1 in protecting the heart and lungs in WT;MRL-Faslpr mice. Taken together, these data emphasize that the interaction of PD-L1 with MRL background genes dictates the phenotype of autoimmune disease. The broad distribution of PD-L1 expression on hematopoetic and parenchymal cells suggests one or both cell types may be central to limiting autoimmune disease during multiple phases of the immune response. The transfer of autoimmune myocarditis with PD-L1−/−;MRL+/+BM suggests that disease is initiated by PD-L1−/− leukocytes. In PD-L1−/−;MRL mice, the majority of infiltrates in the heart and lung are Mø. This is in keeping with the predominance of this subset in the kidney, liver, spleen, and skin during inflammation in MRL-Faslpr mice (34, 35). Transgenic overexpression of MCP-1 by myocardial tissue indicates that recruitment of Mø is sufficient to induce myocarditis (36). However, there are substantial numbers of T cells in the heart and lung of PD-L1−/−;MRL mice and there is a central role for T cells in other spontaneous models of myocarditis (37, 38, 39). Although CD8+ T cells initiate disease, CD4+ T are the primary effectors (39). Thus, it is likely that each of these subsets contributes to the pathogenesis of myocarditis in PD-L1−/−;MRL mice. Additional experiments are needed to decipher the specific role of PD-L1 expression by Mø, and other leukocytic subsets in the induction and progression of myocarditis in MRL mice. Although we transferred disease into WT;MRL+/+ mice with PD-L1−/−;MRL+/+ BM cells; myocarditis was more severe in PD-L1−/−;MRL+/+ mice, which lack PD-L1 expression on hematopoetic and parenchymal cells. Consistent with this finding, PD-L1 expression is dramatically up-regulated in the heart and lung, primarily by endothelial cells, after the induction of inflammation by the transfer of PD-L1−/−;MRL+/+ BM cells. Interestingly, PD-L1 expression on nonhematopoetic is primarily important for prevention of diabetes in NOD mice (26), while PD-L1 expression by hematopoetic cells primarily limits inflammation in an experimental model of autoimmune kidney disease (17). Thus, PD-L1 expression by different cell types is dominant in specific diseases and tissues. By comparison, PD-L1 expression on both host and donor cells is required to limit cardiac (40) or corneal allograft rejection (41). In these models, it is likely that PD-L1 expression on host APCs during the priming phase prevents the induction of alloreactive cells, while PD-L1 expression on donor parenchymal cells limits leukocytic infiltration once the immune response is initiated. Based on these findings, we hypothesize that there is a role for PD-L1 expression on parenchymal cells in limiting myocarditis and pneumonitis once disease is initiated in MRL mice. Although we attempted to test this concept directly by transferring PD-L1−/−;MRL+/+ BM into WT;MRL+/+ and PD-L1−/−; MRL+/+ hosts; the rapidity of disease in PD-L1−/−;MRL+/+ mice compromised the interpretation of these results. Likewise, it would be interesting to examine whether WT;MRL+/+ BM prevents disease in PD-L1−/−;MRL+/+ mice, but again the rapid onset of disease in PD-L1−/−;MRL+/+ mice hamper these studies. To determine whether heart-specific autoAbs were involved in heart disease in PD-L1−/−;MRL mice, we probed for anticardiac myosin and anticardiac troponin I autoAbs. Although we did not detect these autoAbs at early time points (2 wk and 1 mo), we did detect high titers of cardiac-specific autoAbs once myocarditis was established (2 mo). Anticardiac myosin autoAbs are prevalent during myocarditis and induce myocarditis in susceptible mouse strains (42, 43, 44). In addition, immunization with cardiac troponin I induces myocarditis (45). Therefore, in four separate experiments, we transferred serum from moribund PD-L1−/−;MRL mice into WT;MRL-Faslpr (n = 10) and WT;MRL+/+(n = 7) mice and examined hearts 10–14 days after transfer for myocarditis. Serum from PD-L1−/−;MRL did not induce any signs of myocarditis in WT;MRL mice. Although we appreciate there are numerous variables (timing, amount of serum, etc.) that affect the outcome of this experiment, these findings suggest it is unlikely these autoAbs are central to initiating myocarditis in PD-L1−/−;MRL mice. These results are consistent with our finding that heart-specific autoAbs in the serum and C3 deposits in the tissue are not detectable until late in the disease process. However, it remains possible that IgG deposits in the heart may contribute to myocarditis in PD-L1−/−;MRL mice via complement independent mechanisms (Fc receptor engagement, cell surface receptor engagement, etc.). In any case, our findings differ from PD-1−/−;BALB/c mice that develop dilated cardiomyopathy (32), which has been attributed to cardiac-specific autoAbs (31). However, as PD-L1/PD-L2−/−;BALB/c mice do not develop heart disease or have an increase in the rate of mortality, a role for the PD-1/PD-L pathway in the emergence of cardiomyopathy in the PD-1−/−;BALB/c mice is questionable. In summary, PD-L1 is a critical checkpoint that protects the heart and lung in the autoimmune MRL mouse strains. Our findings are consistent with accumulating data, which indicate that disruption of PD-1/PD-L1 pathway accelerates autoimmune disease. In addition, we now report that the phenotype of autoimmune disease is dramatically altered in PD-L1−/−;MRL mice. Similar to MRL mice, human autoimmune diseases often have multiple manifestations, and the differences in patients’ symptoms may be attributed to polymorphisms in specific genes. Interestingly, polymorphisms in the PD-1 gene are associated with several autoimmune diseases including lupus, type 1 diabetes, rheumatoid arthritis, Grave’s disease, and multiple sclerosis (20, 46). As a subset of human lupus patients develop heart and lung disease, including myocarditis and pneumonitis, it is intriguing to speculate that polymorphisms in PD-1 and/or PD-L1 may regulate lupus in patients. We thank Dr. Andrew Lichtman (Brigham and Women’s Hospital, Boston, MA) for insightful discussions, Mary Keir and George Stavrakis for technical advice and assistance, Rodrick Bronson for assistance in evaluating pathology, and Dr. Gordon Freeman (Dana-Farber Cancer Institute, Boston, MA) for providing the anti-PD-1 Ab. ↵1 This work was supported in part by grants from the National Institutes of Health, R01 DK 52369 (to V.R.K.) and P01 AI 56299 (to A.H.S. ), and Genzyme Renal Innovations Program (to V.R.K.). J.L. is supported by a Ruth L. Kirschstein National Research Service Award (F32 DK078416-01). J.M. received support from the Deutsche Forschungsgemeinschaft (ME-3194/1-1). ↵3 Abbreviations used in this paper: Mø, macrophage; autoAbs, autoantibodies; PD-1, programmed-death 1; PD-L1, PD-1 ligand; WT, wild type; BM, bone marrow; DN, double negative. Theofilopoulos, A. N., F. J. Dixon. 1981. Etiopathogenesis of murine SLE. Immunol. Rev. 55: 179-216. Kelley, V. E., J. B. Roths. 1985. Interaction of mutant lpr gene with background strain influences renal disease. Clin. Immunol. Immunopathol. 37: 220-229. Moyer, C. F., J. D. Strandberg, C. L. Reinisch. 1987. Systemic mononuclear-cell vasculitis in MRL/Mp-lpr/lpr mice: a histologic and immunocytochemical analysis. Am. J. Pathol. 127: 229-242. Andrews, B. S., R. A. Eisenberg, A. N. Theofilopoulos, S. Izui, C. B. Wilson, P. J. McConahey, E. D. Murphy, J. B. Roths, F. J. Dixon. 1978. Spontaneous murine lupus-like syndromes: clinical and immunopathological manifestations in several strains. J. Exp. Med. 148: 1198-1215. Matsuzawa, A., T. Moriyama, T. Kaneko, M. Tanaka, M. Kimura, H. Ikeda, T. Katagiri. 1990. A new allele of the lpr locus, lprcg, that complements the gld gene in induction of lymphadenopathy in the mouse. J. Exp. Med. 171: 519-531. Peng, S. L., M. P. Madaio, D. P. Hughes, I. N. Crispe, M. J. Owen, L. Wen, A. C. Hayday, J. Craft. 1996. Murine lupus in the absence of α β T cells. J. Immunol. 156: 4041-4049. Christianson, G. J., R. L. Blankenburg, T. M. Duffy, D. Panka, J. B. Roths, A. Marshak-Rothstein, D. C. Roopenian. 1996. β2-microglobulin dependence of the lupus-like autoimmune syndrome of MRL-lpr mice. J. Immunol. 156: 4932-4939. Lenda, D. M., E. R. Stanley, V. R. Kelley. 2004. Negative role of colony-stimulating factor-1 in macrophage, T cell, and B cell mediated autoimmune disease in MRL-Fas(lpr) mice. J. Immunol. 173: 4744-4754. Chan, O. T., M. P. Madaio, M. J. Shlomchik. 1999. The central and multiple roles of B cells in lupus pathogenesis. Immunol. Rev. 169: 107-121. Hewicker, M., G. Trautwein. 1986. Glomerular lesions in MRL mice. A light and immunofluorescence microscopic study. Zentralbl. Veterinarmed. B 33: 727-739. Watson, M. L., J. K. Rao, G. S. Gilkeson, P. Ruiz, E. M. Eicher, D. S. Pisetsky, A. Matsuzawa, J. M. Rochelle, M. F. Seldin. 1992. Genetic analysis of MRL-lpr mice: relationship of the Fas apoptosis gene to disease manifestations and renal disease-modifying loci. J. Exp. Med. 176: 1645-1656. Vidal, S., D. H. Kono, A. N. Theofilopoulos. 1998. Loci predisposing to autoimmunity in MRL-Faslpr and C57BL/6-Faslpr mice. J. Clin. Invest. 101: 696-702. Kinoshita, K., G. Tesch, A. Schwarting, R. Maron, A. H. Sharpe, V. R. Kelley. 2000. Costimulation by B7-1 and B7-2 is required for autoimmune disease in MRL-Faslpr mice. J. Immunol. 164: 6046-6056. Menke, J., J. A. Lucas, G. C. Zeller, M. E. Keir, X. R. Huang, N. Tsuboi, T. N. Mayadas, H. Y. Lan, A. H. Sharpe, V. R. Kelley. 2007. Programmed death 1 ligand (PD-L) 1 and PD-L2 limit autoimmune kidney disease: distinct roles. J. Immunol. 179: 7466-7477. Gotsman, I., N. Grabie, R. Dacosta, G. Sukhova, A. Sharpe, A. H. Lichtman. 2007. Proatherogenic immune responses are regulated by the PD-1/PD-L pathway in mice. J. Clin. Invest. 117: 2974-2982. Sharpe, A. H., E. J. Wherry, R. Ahmed, G. J. Freeman. 2007. The function of programmed cell death 1 and its ligands in regulating autoimmunity and infection. Nat. Immunol. 8: 239-245. Keir, M. E., M. J. Butte, G. J. Freeman, A. H. Sharpe. 2008. PD-1 and its ligands in tolerance and immunity. Annu. Rev. Immunol. 26: 677-704. Nishimura, H., M. Nose, H. Hiai, N. Minato, T. Honjo. 1999. Development of lupus-like autoimmune diseases by disruption of the PD-1 gene encoding an ITIM motif-carrying immunoreceptor. Immunity 11: 141-151. Latchman, Y. E., S. C. Liang, Y. Wu, T. Chernova, R. A. Sobel, M. Klemm, V. K. Kuchroo, G. J. Freeman, A. H. Sharpe. 2004. PD-L1-deficient mice show that PD-L1 on T cells, antigen-presenting cells, and host tissues negatively regulates T cells. Proc. Natl. Acad. Sci. USA 101: 10691-10696. Taqueti, V. R., N. Grabie, R. Colvin, H. Pang, P. Jarolim, A. D. Luster, L. H. Glimcher, A. H. Lichtman. 2006. T-bet controls pathogenicity of CTLs in the heart by separable effects on migration and effector activity. J. Immunol. 177: 5890-5901. O'Connor, K. C., K. Nguyen, B. D. Stollar. 2001. Recognition of DNA by VH and Fv domains of an IgG anti-poly(dC) antibody with a singly mutated VH domain. J. Mol. Recognit. 14: 18-28. Keir, M. E., S. C. Liang, I. Guleria, Y. E. Latchman, A. Qipo, L. A. Albacker, M. Koulmanda, G. J. Freeman, M. H. Sayegh, A. H. Sharpe. 2006. Tissue expression of PD-L1 mediates peripheral T cell tolerance. J. Exp. Med. 203: 883-895. Njoroge, J. M., L. B. Mitchell, M. Centola, D. Kastner, M. Raffeld, J. L. Miller. 2001. Characterization of viable autofluorescent macrophages among cultured peripheral blood mononuclear cells. Cytometry 44: 38-44. Lund, F. E.. 2008. Cytokine-producing B lymphocytes-key regulators of immunity. Curr. Opin. Immunol. 20: 332-338. Li, Y., J. S. Heuser, L. C. Cunningham, S. D. Kosanke, M. W. Cunningham. 2006. Mimicry and antibody-mediated cell signaling in autoimmune myocarditis. J. Immunol. 177: 8234-8240. Cunningham, M. W.. 2004. T cell mimicry in inflammatory heart disease. Mol. Immunol. 40: 1121-1127. Okazaki, T., Y. Tanaka, R. Nishio, T. Mitsuiye, A. Mizoguchi, J. Wang, M. Ishida, H. Hiai, A. Matsumori, N. Minato, T. Honjo. 2003. Autoantibodies against cardiac troponin I are responsible for dilated cardiomyopathy in PD-1-deficient mice. Nat. Med. 9: 1477-1483. Nishimura, H., T. Okazaki, Y. Tanaka, K. Nakatani, M. Hara, A. Matsumori, S. Sasayama, A. Mizoguchi, H. Hiai, N. Minato, T. Honjo. 2001. Autoimmune dilated cardiomyopathy in PD-1 receptor-deficient mice. Science 291: 319-322. Schoen, F. J.. 2004. The heart. V. Kumar, and N. Fausto, and A. Abbas, eds. Robbins/Cotran Pathologic Basis of Disease 7th Ed.555-618. W.B. Saunders, Philadelphia. Bloom, R. D., S. Florquin, G. G. Singer, D. C. Brennan, V. R. Kelley. 1993. Colony stimulating factor-1 in the induction of lupus nephritis. Kidney Int. 43: 1000-1009. Yui, M. A., W. H. Brissette, D. C. Brennan, R. P. Wuthrich, V. E. Rubin-Kelley. 1991. Increased macrophage colony-stimulating factor in neonatal and adult autoimmune MRL-lpr mice. Am. J. Pathol. 139: 255-261. Kolattukudy, P. E., T. Quach, S. Bergese, S. Breckenridge, J. Hensley, R. Altschuld, G. Gordillo, S. Klenotic, C. Orosz, J. Parker-Thornburg. 1998. Myocarditis induced by targeted expression of the MCP-1 gene in murine cardiac muscle. Am. J. Pathol. 152: 101-111. Elliott, J. F., J. Liu, Z. N. Yuan, N. Bautista-Lopez, S. L. Wallbank, K. Suzuki, D. Rayner, P. Nation, M. A. Robertson, et al 2003. Autoimmune cardiomyopathy and heart block develop spontaneously in HLA-DQ8 transgenic IAβ knockout NOD mice. Proc. Natl. Acad. Sci. USA 100: 13447-13452. Taylor, J. A., E. Havari, M. F. McInerney, R. Bronson, K. W. Wucherpfennig, M. A. Lipes. 2004. A spontaneous model for autoimmune myocarditis using the human MHC molecule HLA-DQ8. J. Immunol. 172: 2651-2658. Hayward, S. L., N. Bautista-Lopez, K. Suzuki, A. Atrazhev, P. Dickie, J. F. Elliott. 2006. CD4 T cells play major effector role and CD8 T cells initiating role in spontaneous autoimmune myocarditis of HLA-DQ8 transgenic IAb knockout nonobese diabetic mice. J. Immunol. 176: 7715-7725. Tanaka, K., M. J. Albin, X. Yuan, K. Yamaura, A. Habicht, T. Murayama, M. Grimm, A. M. Waaga, T. Ueno, R. F. Padera, et al 2007. PDL1 is required for peripheral transplantation tolerance and protection from chronic allograft rejection. J. Immunol. 179: 5204-5210. Shen, L., Y. Jin, G. J. Freeman, A. H. Sharpe, M. R. Dana. 2007. The function of donor versus recipient programmed death-ligand 1 in corneal allograft survival. J. Immunol. 179: 3672-3679. Liao, L., R. Sindhwani, M. Rojkind, S. Factor, L. Leinwand, B. Diamond. 1995. Antibody-mediated autoimmune myocarditis depends on genetically determined target organ sensitivity. J. Exp. Med. 181: 1123-1131. Kuan, A. P., W. Chamberlain, S. Malkiel, H. D. Lieu, S. M. Factor, B. Diamond, B. L. Kotzin. 1999. Genetic control of autoimmune myocarditis mediated by myosin-specific antibodies. Immunogenetics 49: 79-85. Kuan, A. P., L. Zuckier, L. Liao, S. M. Factor, B. Diamond. 2000. Immunoglobulin isotype determines pathogenicity in antibody-mediated myocarditis in naive mice. Circ. Res. 86: 281-285. Goser, S., M. Andrassy, S. J. Buss, F. Leuschner, C. H. Volz, R. Ottl, S. Zittrich, N. Blaudeck, S. E. Hardt, G. Pfitzer, et al 2006. Cardiac troponin I but not cardiac troponin T induces severe autoimmune inflammation in the myocardium. Circulation 114: 1693-1702. Okazaki, T., T. Honjo. 2007. PD-1 and PD-1 ligands: from discovery to clinical application. Int. Immunol. 19: 813-824.